In efforts to integrate with other public good projects, the Lens provides functionalities to record inventorship in an open and transparent way. Recording Inventorship essentially links an inventor name on a patent to his/her Lens account allowing for a clear association between a specific user (inventor) and invention (patent document for that inventor). By doing so, the user shares that information with others and enable them to recognize or connect with his/her inventions. For example, your shared information includes the name recorded on your account and which links to your personal profiles or records on services such as ORCID® an LinkedIn®. See Linked Services for more information about linking to external services. 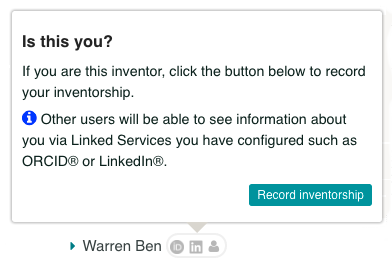 4.using the popup dialog associated with the icons next to your name in the “Inventors” sections, record your inventorship. You can record your inventorship in the “Document Summary” view or “Search Result” views (you will need to expand the patent detail in the “Search Result” views). Hover your mouse pointer over the inventorship icons to display the dialog. 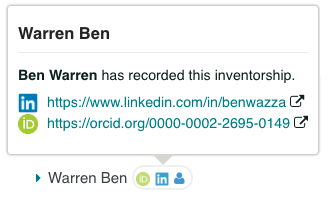 The ORCID and LinkedIn icons will be coloured if a user has recorded their inventorship and has linked their Lens account with those services. Red – (with subscript ‘unmatched’) there is no longer a match on the document record for the name associated with your inventorship. This should be an extremely rare case and most likely due to a change in the formatting of your name in the data we get from the patent offices. You can delete these records and claim your name again with new formatting. Other users won’t see your unmatched records. Record and remove inventorship records. Display the name of the recording user. If a user has “Linked Services” such as ORCID or LinkedIn enabled, other users will see links to their public profiles or records on those services. Dispute other’s inventorship records if required. Where are my inventorship records? How can I share them with others? 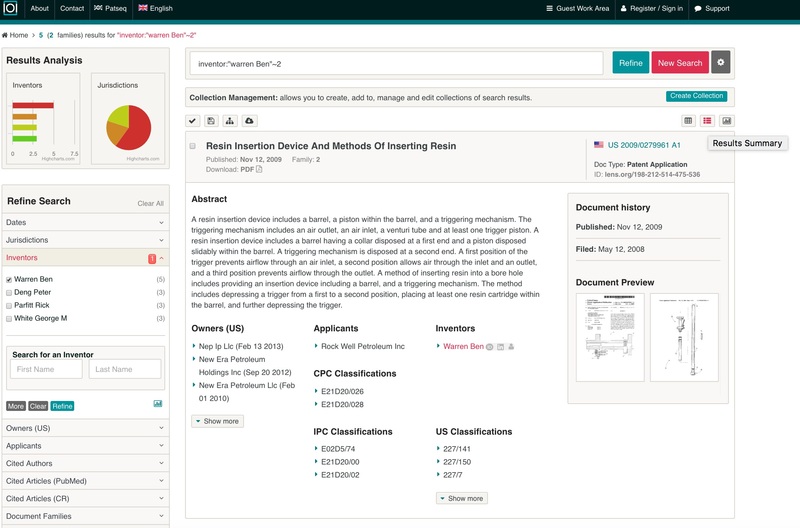 The “Inventorship” tab in the Work Area allows you see how many inventorship records you have and to view them as a search result. You can also see the status of your record synchronisation with ORCID and manually sync your records to your ORCID record if needed (see below). The Lens can only manage work entries for which it is the source so there is no concern for any of your other work entries being affected by inventorship record synchronisation. Every time you create or delete an inventorship record, all your records are saved back into your ORCID record ensuring your Lens ORCID works reflect your inventorship records. If your Lens ORCID work entries are detected to get out of sync with your inventorship records (i.e. due to system issues or if you deleted a Lens Work record in your ORCID record) you can manually sync your inventorship records to ORCID using the “ORCID Sync” button in either the Inventorship Dialog or the Work Area Inventorship tab.